A common definition of spectral width is the full width at half maximum (FWHM), but other definitions are also used. 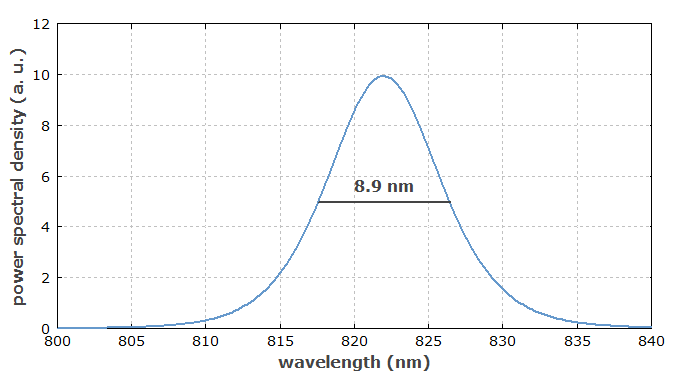 Figure 1: The optical spectrum of an unchirped 80-fs ultrashort light pulse. Its full width at half maximum bandwidth is 8.9 nm, corresponding to 3.9 THz. can be used. This shows that 1 nm is worth more gigahertz if the center wavelength is shorter. If you choose a longer center wavelength, you will see that one nm is worth fewer GHz! The term bandwidth is also often used for the data rate (e.g. in Gbit/s) achieved in an optical communication system. Precisely, the data rate is limited by the optical bandwidth, but is not really itself a bandwidth. The optical bandwidth of a light source is strongly related to the temporal coherence, characterized with the coherence time. Both for passive resonators (e.g. optical cavities) and for the output of oscillators (e.g. lasers), the Q factor is the oscillation frequency divided by the bandwidth. For optical data transmission, one usually requires an optical bandwidth of the signal which about equals the bit rate. In principle, the bit rate could be somewhat larger than the bandwidth, but that would require a high signal-to-noise ratio. In practice, some of the spectral efficiency may be sacrificed for other advantages such as a reduced channel cross-talk in wavelength division multiplexing systems. In the area of optical fiber communications, one often specifies the bandwidth of a fiber, understood as the maximum allowable signal bandwidth under the condition that the bit error rate stays reasonably low. That bandwidth is often inversely proportional to the fiber length; therefore, one often specifies the bandwidth–distance product. The allowable signal bandwidth can also depend on other factors, such as details of the optical transmitter, the launch conditions and the modulation format. In case of multimode fibers, the bandwidth is usually limited by intermodal dispersion, and it is then called modal bandwidth. The maximum signal bandwidth is often determined based on time-domain measurements. Essentially, one measures the temporal response of the system (output power vs. time) when ultrashort pulses are launched into the fiber. From such results, one can estimate the transfer function, and from its Fourier transform one can obtain the bandwidth. Note that the bandwidth of a fiber has little relation to the optical bandwidth, as it is a signal bandwidth; it is only that a large optical bandwidth of signals may reduce the effective bandwidth of the fiber, particularly in cases where chromatic dispersion is a limiting factor.